With its splicing of pale rose, geranium, litchi and peony, the Diaphanous Hour spins its delicate accords around the palest, airiest register of the rose family, the pink-tinged flesh of the litchi seeping into the disheveled petals of the peony, the geranium lending its cool mintiness to the dawn-tinged rose. The blend has the charm of an informal bouquet brought back from the garden in the morning still heavy with dew, a watercolour in shades of dawn. Of the three new Heures de Parfum, it is undoubtedly the most conservative and the one which would have been the most likely to come out in the mainstream: it fills a missing slot in the collection, that of the straightforward floral. Though Mathilde Laurent has composed a perfectly lovely scent and thus proven she can do the transparent florals currently in vogue with the best of them, she’s made of sterner stuff, and within the creative freedom the Heures collection affords her, she must have had more fun elsewhere. Or maybe it's just that I don't have much taste for watercolours: clearly, Diaphane has been eclipsed for me by her more spectacular sisters, but one can just envision the Far-East clientele falling for it. When the new trio comes out in November, Cartier’s Heures de Parfum collection will comprise eight fragrances, several of which are amongst the best stuff to come out in the past year – La Treizième Heure won both the Perfumers’ Award and the Specialists’ Award from the Fragrance Foundation France, which is saying a lot since it went up against 100 other launches in the long list. Though there's scant chance the same perfumer and house can win two years in a row, L'Heure Fougueuse fully deserves to make it to the short list again next year. Tell me in your comments what's the next Heure you'd love to see, explaining why the chosen notes would suit a particular hour, and I’ll draw a 1.5 ml sample of the Heure de Parfum of your choice from the first series, from the sample set I got when it was launched. I'll only include the comments that make a case for a scent, so put on your thinking cap! For another take on VIII – L’Heure Diaphane, those of you who read French can click here for Ambre Gris’ review – as we discovered the fragrances at the same time, we decided to post on them simultaneously, but without comparing notes. Illustration: Peonies by Edouard Manet. Hmm... well, we've got to have a vetivert, but it ought to be raw and smoky, so perhaps that would suit 9 o'clock... and if we mix it with 'dinner party notes' (wine? rich sauces? brandy?) then we'd have something that bridges the gap between the civility of the evening and the promise of what the night might bring. Persolaise, vetiver and wine (or cognac) might work through their common woodiness -- and if it's certain white wines, through the mineral facets. Olga, I've been dreaming of a proper linden fragrance like the one you describe. Apparently, it's really tough to pull off, especially the volume created by the trees. But wouldn't it be wonderful? There needs to be a tidal hour; a bit of salty ambergris, of driftwood campfire smoke, and something to give the feeling of a rising wind. Not seaweed but stones, maybe a juniper or fir in the distance, an hour escaped. Maggi, that's utterly beautiful... I really hope Mathilde will be reading this! 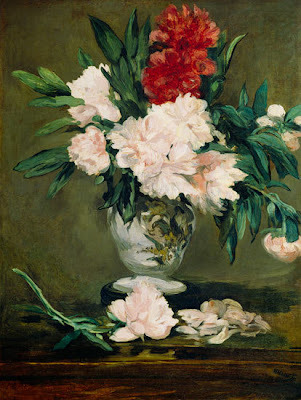 PS: I like watercolor florals if they're well done and of high quality, like JCE's. How was the quality of materials for this one, and how natural did it smell? Most florals of the past 5 years have been utterly synthetic. Hmm, I'm thinking Heure II or III could be an earthy, rain-like spring scent, after the Heure Promise and before Fougeuse and Brillante which seems closer to summer. I'm considering the Heures as parts of a year in this case. Marla, Diaphane *does* smell of good quality materials. The problem is, as Ambre Gris states in her own review, that this type of note is often found in functional fragrances which makes it harder to perceive the naturalness, in a way, as though there were another layer superimposed on the smell of the flowers. But no, it didn't smell synthetic. Irina, and what would be the notes you'd propose? I know: you asked for one, but I would love to see the following different hours. IX – l’heure ethilique: rum, benzoin. I know most of the accords I suggest are not "new", but as usual, I think the ability of a good perfumer can turn familiar notes into something new and fabulous! I know what you mean. While traveling in rural Turkey and other countries in the area, I was given lots of warm, steamy cloths infused with flowers and citrus colognes during train or bus travel. At the time, they were natural and beautiful, though I'm sure now they use mostly synthetics. But you don't want to buy an expensive perfume and think, "I'm waking up after a bumpy all-night bus ride, seated next to several goats and some chickens."! I should add, I've got nothing against goats, they smell great! Zazie, you're absolutely right, a talented perfumer shows her mettle by working on known accords in a new light. However, as I answered a French commenter, we may never see a Mathilde Laurent tuberose: it's a note she detests! And as she's already done two scents with tea notes... I'm afraid that one would be out of the running too. I'd love to see what she'd do with a dark rose. My 5 p.m. would be L'Heure Paisible. It would be the scent of lazy weekend afternoons I used to spend in the country, when winter was giving way to spring and the air was full of the smell of almond blossoms, tea, anisette (to get warm) and freshly baked anise rolls. Marla, a floral-citrus *with* goat, maybe? I'd certainly love to see her work on a dirty musk, though in fact, there's already a lot of that in L'Heure Fougueuse. Isa, it's true there's no almond-anisic in the collection... Yum! You're right of course: I told myself that Mathilde Laurent did tea already, but I thought that since she used it twice, it means it's a note she loves to work with... Anyway, I hope she keeps the milky-burnt-sandalwood idea: I am still wearing my ehoiste-bois des iles experiment, and I feel in perfume heaven. Interesting that Mrs. Laurent doesn't like tuberose, it is a polarising smell, that's for sure. Did she tell you which facets she finds displeasing? I wouldn't mind if she made my "heure reveuse" with a rich blend of white flowers and a green top, instead of using tuberose! Zazie, no, she didn't tell me. It's just this instinctive "no!". Selfishly, since I enjoy orange blossom so much, I would love to see an orange blossom-centric perfume in Les Heures de Parfum. Because orange blossoms are traditionally linked to weddings, perhaps it could be the new II: the number that you get when you add one and one. I would call it something like the Joining Hour or the Unifying Hour--I'm sure there's a clever name for it in French. Benzoin is another favorite of mine. I agree with Zazie that Benzoin fits with the ninth hour, but I would pair my benzoin with sandalwood, or lavender. I would name it something like the Serene Hour or the Tranquil Hour. Again, I'm sure there's a more beautiful name for it in French. I'd like something that reminds me of walks outdoors for Heure V. Maybe something with galbanum, tobacco, hay, a tiny bit of leather or tea for smoke. I would like to smell L'Heure XI, maybe let's call it Mystique? It is dark outside already, time to calm down and chill-out. Some relaxing aromas of lavender mixed with hint of incense and French herbs, all on a bit smoky and woody trail. Now I see that I am not the only one who suggested lavender as one of main key notes. Seems like it is logical path! My vote is for XI, L'Heure Desesperee (is that right? The Desperate Hour?). I'd want it to be boozy, maybe an underused booze in perfume, like a Tawny port accord, with a musky animalic base. So it would be something like L'Heure Folle, but darker, overripe, wild-eyed. Some of these ideas are so fabulous, I do hope somebody in the know takes them up. I would like a dark and dangerous gothic violet scent, like the sky when night has almost completely descendend but it's still deep purple rather than black, you can smell the shadow of the night and the laguid last breath of the day, let's say at the IX hour. My French is non-existent so I won't attempt a title. Kristina, a gorgeous galbanum and hay scent would be great, wouldn't it? Well, I'm devastated to learn that Ms. Laurent doesn't like tuberose, because that's what I was longing for (quelle surprise, I know). For 3:00 - high hot afternoon in my part of the world. I was hoping for a blazing bright tuberose, with maybe a little something raspy like frankincense at the bottom to shade it into the evening. L'heure incandescente. But. Since no tubey is forthcoming, how about an amber for 11:00? 11 pm is that hour where things could go either way -- you can turn in for bed & get a good night's sleep, or you can throw caution to the wind and stay up late. So how about L'heure du précipice - snuggly comforting amber with with spices and coffee and a shot of some sparkly adlehydes at the beginning to give you your second wind. 5 pm should smell of afternoon coffee, a hint of vanilla cupcake on the side and a whiff of rubber from the building up rush hour traffic. Elisa, booze and musk doesn't sound desperate, it sounds like a party! L'Heure festive? Silvia, Gothic violet sounds... so English! Couldn't very well call it L'Heure Violette I guess because that would sound too derivative... Someone else suggested L'Heure Mystique... Maybe L'Heure Dangereuse? But for that incandescent tuberose I'd think Vamp à NY would suffice, wouldn't it? Hmm... I would like to see one called II: L'Heure Poétique (for 2 AM). L'Heure Poétique would be violet and lavender on a late night breeze, an airy fragrance, cool, dark, and sweet, for the wakeful poet walking outside beneath the stars. I know I've already put in my two cents' worth, but can I just say that some of these ideas have been a joy to read! And... just to add to my humble little vetivert 'brief'... if we had a wine/cognac note to suggest the dinner party, then perhaps an interesting contrast could be provided by a cotton (or silk/satin??) note to suggest the bedroom? 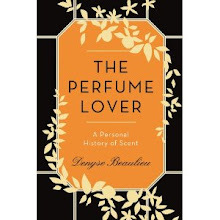 You'll have to forgive me for only being familiar with this perfumer's work through your delightful reviews on this series, so I'm musing on my imaginings alone! XI - a unique take on a tuberose soliflore, exploring the odder, colder facets and marrying them to an evergreen forest. Ever since Tubereuse Criminelle highlighted the cold-freshness hidden in the blossom and its affinity for wintergreen, Ive thought that a clean cold tuberose would be a perfect pairing for a fir note. I love the idea of spicy-fresh-green top with fir and star anise, leading to a big tuberose tilted towards fresh rather than creamy, adorned with touches of violet and greenery, with a base with a smooth cypress, musk, and Atlas cedar. I thinking something bold and exciting rather than demure, so what hour could I choose but "The eleventh hour", with its connotations of danger and immediacy. I would say that for the ninth hour, a dessert hour, I would like to see a fragrance based around cardamom, with almonds and honey. I had that most unusual cardamom pastry when I was in India last year. It was so beautiful and "scentful," that had to wonder what it would "taste like" as a fragrance. Thank you for including me in the draw. In light of unwanted tuberosity, I'm going to revise my hour, formula, and give it a new name! If one is doing a series on hours, why not take advantage of the historic "green hour" and its absinthe associations? Still taking fir and star anise as top notes, but I'd add more greenery and an intense herbal presence - I'm thinking touches of hyssop, wormwood, and perhaps some mint to bring it in line with traditional absinthe recipes, but with some persistent synthetic greens so that a cool green feeling lasts into the drydown with body. Instead of a traditional transparent absinthe fragrance, though, I'd love for this to try down into something woody, creamy, and animalic along with that persistent green, musk, violet, cypress, cedar, coumarin, and perhaps a mild touch of civet and leather to give it edge. Persolaise, well that cotton would have to be musk... but clean sheets or a little... funky? Sugandaraja, I see you've read my reply about the tuberose... besides, you wouldn't want Mathilde to do a tuberose after everybody else, would you? Mind you, your idea sounds great! And I think Dominique Ropion has already done a tuberose, yes? Violetnoir, that actually sounds as though it were for Jean-Michel Duriez who's got such a sweet tooth... Mind you, he's already done dessert! Sugandaraja, that's practically a brief right there! The hours idea makes me think of the Mayakovsky poem, 'Past One O'clock'. II could be the Melancholy Hour, with the scents of a passed thunderstorm and a hard rainfall. Hmm.... I'm going to get metaphysical on you. In numerology, 11 is one of the sacred numbers, so for the XIth hour, I would propose incense, resins, woods and spices. Perhaps a touch of rose, maybe the traditional citrus/bergamot opening? There are already too many sacre's in perfume so no L'Heure Sacre. L'Heure Metaphysique? Sainte? I've loved the suggestions so far. I sincerely hope Ms. Laurent sees them. BTW, I'm wearing her Attrape Coeur today! XIV Heure, I would call it L'Heure du Monde, I think it's a time when we are very receptive with what is happening all over the world, through the news, while we have lunch at the restaurant,for example. It should be invigorating but not too much, perhaps some fresh satsuma,grapefruit or tangerine, and a bouquet of jasmin and a bit of wine-grape scent,subtle for a nice siesta in our minds..
Rappleyea, she's kind of done incense already in L'Heure Mystérieuse, but I'd totally go for a mystical scent. I'm noticing a lot of resins and smokiness in the suggestions -- do you think it's a perfume aficionado thing, or it is her previous scents that seem to call for it? Vintage Lady, I'd totally go for a grapefruit, jasmine and wine-grape scent... Some people are seeing 2 PM as a moment when you tune in, some see it as a moment to tune out (siesta)... Both are great options! D. - I think I missed it because XII was the one, that while I liked it, it disappeared in about an hour on me. I was thinking more of an incense-spice scent. XII was very light to me. I think both of your reasons are probably true - perfumistas seem to love incense, and a heavier, spicier scent could fill in a spot in the collection. Whatever she does, it will be very interesting to see. The fifth hour should be bold and have spice with a hint of floral how about violet,saffron, carnation and coconut? I arrive late at this post, and read with admiration. It feels as if all great notes and essences have been mentioned. And yet, so many hours are lived out of their alloted function. Lovers still meet not at twilight, vacations are not always taken in season. Cedar,cypress, galbanum, wet moss on stone, right after rainfall, crushed dandelion,dark iris, the lemon that wafts from the darkest rose, oak, full blown musks,benzoin. Is it impossible? Rappleyea, I'm flabbergasted that L'Heure Mystérieuse was fleeting on you. The stuff has the half-life of plutonium and gigantic sillage: it's one of the few I need to apply with a light hand. I know about different skin chemistries and so forth, but it seems rather incomprehensible. Was it straight from the Cartier bottle? 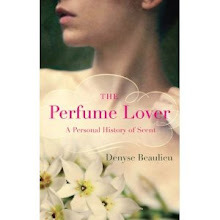 The one note I can't see with the others in your list is benzoin -- but then, I'm not a perfumer! It seems too balsamic compared with green, earthy, woody notes... The crushed dandelion has me musing. Mm...not a perfumer either, but the benzoin is incongruent with the theme. I don't know what is your appreciation of Pierre Guillaume, and I lack the professional information to truly judge him, but there is a fragrance by him called Cedre Sandaraque of which I like the journey (more than the fragrance). I want to imagine that performed and reenvisioned with the elegance and daring of Mathilde Laurent. EEM, Pierre Guillaume is so prolific I've never actually managed to catch up with his output. Because PG is his own brand, he can pretty much put out whatever he pleases, so he's at liberty to experiment. But in this case, no, I've never smelled the scent. I wanted so badly to be in the draw, but I find myself undeserving. This is more a concept than a note - but I'd be so interested to discover what Mathilde might do with it. Last year, when I asked my new MA students to name their personal memorable smell, one of them - newly arrived from India - named the scent of the earth after the first rains of the monsoon. Her descriptions were of all that the scent means - associations with young love in all its hopefulness, romance, the coming of the new, and the celebration of all these in the songs and poems set in the season & its landscapes. We were all transfixed by what she said and how she said it. Months later,when, after our London intensive, I went back to try to find the name of the scent in my notes, I remembered it not as earth but as flower, and had to be corrected. The name is saundhi. I think the smell of moist earth & of celebration could be either the 5th or the 11th hour - when I look at what would be on either side. The monsoon earth smell can be found in an attar called Mitti Atter, and the source in the United States I find most reliable is White Lotus, though other people have had good experiences with other sources. On the website of White Lotus Aromatics (with which I am not associated) is a wonderful description of the process. It is a very evocative scent, even without knowing the process. In the 'conte' "Peau d'Ane" (i like Perrault's version) the heroine has three legendary dresses. If i remember right: one like the moon, one like the sun, one like the stars. I'd want the fragrance felt as she steps out of the woods and the Peau d'Ane into the palatial space, after wearing one of those luminous personae: a transition from the sumptuous woods and earth to man made sumptuousness. Maggi, thanks for the info, I'll look it up. EEM, I remember it as "Une robe couleur du temps" (then there are a Moon and a Sun dress). Maybe every fragrance is a dress the colour of time? bThere are three perfumers I know of who could do that, and Mathilde Laurent is one of them. Back to work now, wearing a little bit of Attrape Coeeur because the blog reminded me of it. D. - No, it wasn't from the Cartier bottle, but a TPC sample. ALL scents last through showers on my skin no matter how much I scrub. The only exceptions were XII and Guerlain's Mitsouko Fleur de Lotus. Perhaps I should try again?? and,of course, Isabelle Doyen...mm...i didn't know that I already know these names, these authors' names. EEM, I can't quibble with that list! Rappleyea, I think you should. L'Heure Mystérieuse fairly tatoos me (I don't have a scent-eating skin either).